Founder, Chairman and CEO of Synopsys Inc., he is a fellow of IEEE and Phil Kaufman Award winner. He graduated with a Masters degree in Electrical Engineering (1978) from the École Polytechnique Fédérale de Lausanne (Swiss Federal Institute of technology), EPFL, Switzerland followed by a Ph.D. from Southern Methodist University, Texas, USA. Since co-founding Synopsys in 1986, he has expanded the company from a start-up synthesis enterprise to the world leader in electronic design automation. He has long been considered one of the world's leading experts on logic synthesis and simulation, and frequently keynotes major conferences in Electronics and Design Automation. He was chosen by Electronic Business magazine as one of "The 10 Most Influential Executives". He was honored for pioneering the commercial logic synthesis market by being named the third recipient ever to receive the IEEE Circuits and Systems Society Industrial Pioneer Award. In 2002, shortly after transacting the largest merger in electronic design automation (EDA) history, he was named CEO of the Year by Electronic Business magazine; and in 2004, Entrepreneur of the Year in IT for Northern California by Ernst & Young. He is also the recipient of the 2008 Phil Kaufman Award (considered as the Nobel prize in EDA) for distinguished contributions to EDA and in 2004, he received the Ernst & Young Entrepreneur Of The Year© Award. 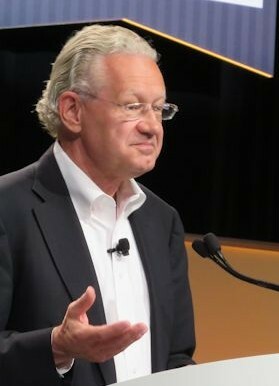 His leadership was recognized in 2007 when the Silicon Valley Leadership Group awarded him with their “Spirit of the Valley” Lifetime Achievement Award. He is active in the business community, serving on the Boards of the Silicon Valley Leadership Group (SVLG), Applied Materials, the Global Semiconductor Alliance (GSA), and the Electronic Design Automation Consortium (EDAC). He is also heavily involved in education for the next generation, having created the Synopsys Outreach Foundation in 1999, which promotes project-based science and math learning throughout Silicon Valley.